Catbalogan means “an everlasting place of safety,” and for hundreds of years it was safe—for pirates. The sheltered bayside harbor lies just north of the San Juanico Strait between Samar and Leyte, a key access point to the Pacific Ocean and the primary shipping route for the Spanish galleons. Since these vessels were headed to Manila with silver and then back to Acapulco with a hold full of porcelain and spices, they were ripe targets for pirates, right? And by “pirates” I mean the English and the Dutch privateers, who were licensed by their sovereigns to interdict and steal the Spanish bounty. 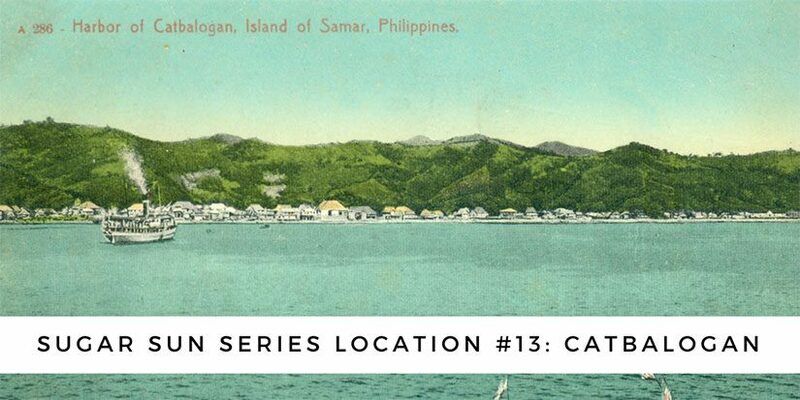 Catbalogan became a haven for pirates and privateers, their crews, and lost sailors. The southern mouth of the San Juanico Strait is right near Tacloban. Start there and follow the curve north and west into the bay above Leyte. The strait is 38 kilometers long and, at its narrowest point, 2 kilometers wide. The Americans would find the city no easier to manage in the early twentieth century. For the first year of the Philippine-American War, the Yanks mostly ignored Samar because they had their hands full in Luzon. But then, in January 1900, gunships arrived offshore Catbalogan and sent a messenger to General Vicente Lukban, the Philippine revolutionary in charge of Samar and Leyte. 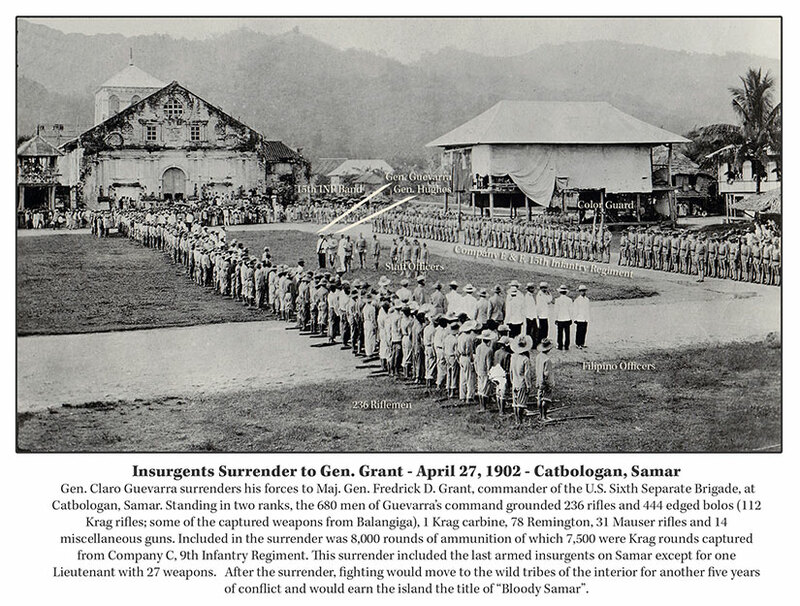 The Americans wanted to negotiate a surrender of the whole island by offering Lukban the governorship of Samar. But Lukban wanted more than a title; he wanted full local autonomy. The Americans refused, so Lukban forbade them from landing. In turn, the Americans began to bombard the town. In other words, things escalated fast. Unable to withstand the US Navy’s firepower, Lukban and many of the locals abandoned Catbalogan, burning it as they retreated. What followed was a ruthless two-year war to subdue the revolutionary forces in Samar. 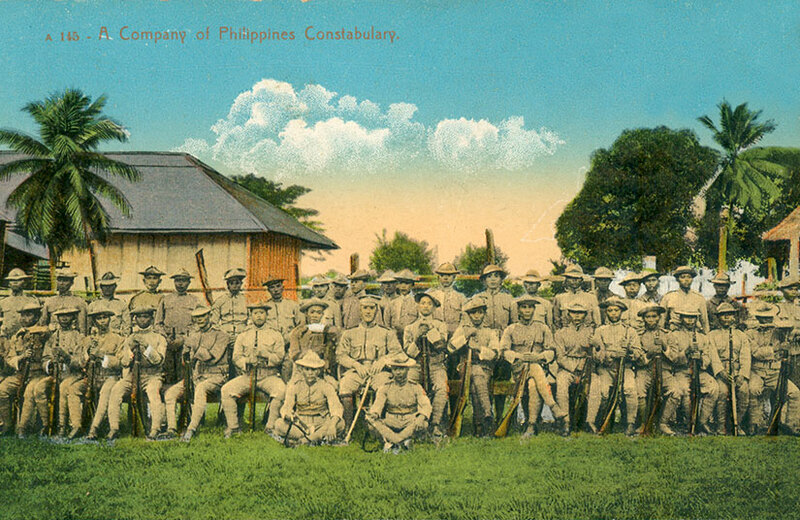 Company C of the Ninth Infantry was stationed to Balangiga to prevent Lukban’s men from using the southern port to import arms and supplies. On its own accord, the town ambushed the garrison in September 1901, and the American military took revenge on all of Samar. General Jacob Smith (known in the press as “Hell-Roaring Jake”) vowed to make the island a “howling wilderness.” Dusting off a legal gem from the American Civil War known as General Order 100, the Americans aimed to starve, burn out, torture, and kill as many guerrillas as possible. They even took the bells of Balangiga church. Catbalogan and Tacloban (Leyte) were the centers of American authority in this period. USS Vicksburg sailors led by Lieutenant Henry V. Butler (later rear admiral) burning a village in Samar, October 1901. 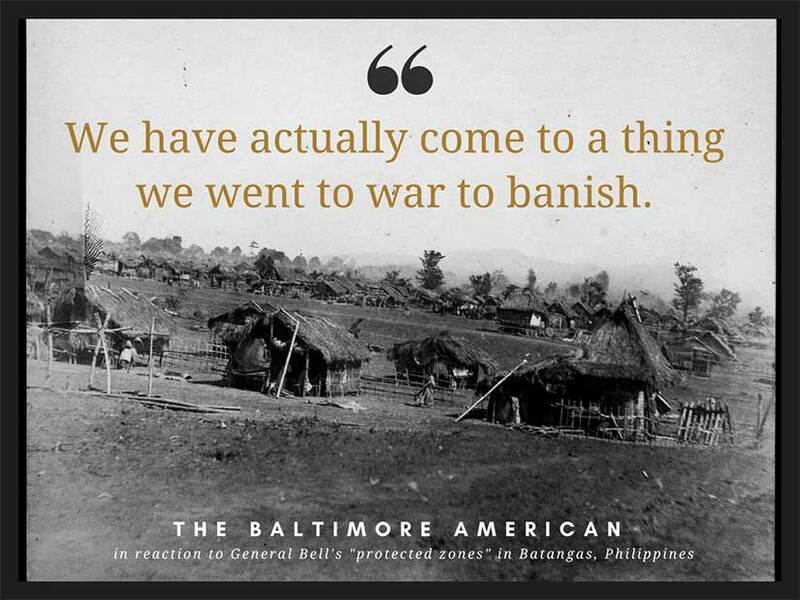 Photo courtesy of Arnaldo Dumindin and his excellent website on the Philippine-American War. 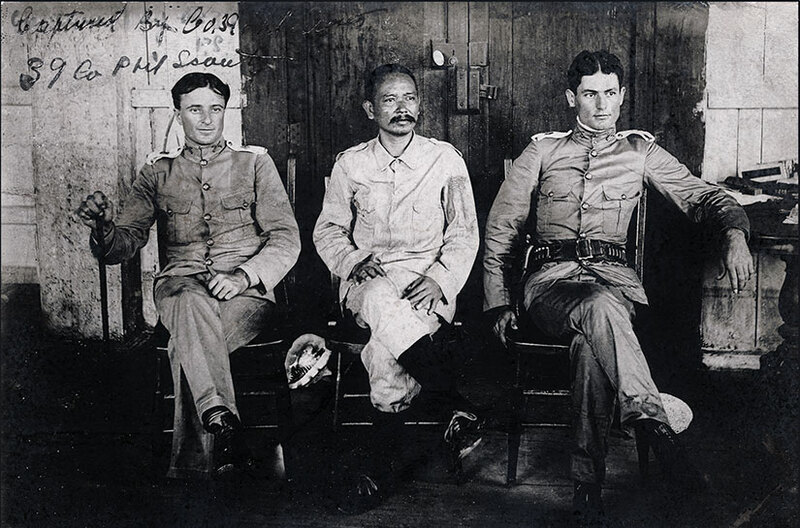 Those surrendering had to turn over their rifles captured from Balangiga the previous year and pledge loyalty to the United States, but then they were freed. Lukban himself would become mayor of the Tabayas province (now Quezon) within ten years. This begs the question of whether it was the severity of the fight or the quality of the peace that pacified the countryside? Amnesty is not used much in America’s modern war playbook, and I wonder if this is an oversight. There is an interesting fashion note worth mentioning: the Americans did loan the revolutionaries a few Singer sewing machines so they could surrender in style with new (and complete) uniforms. Pride was salvaged all around. This is not the end of the story, though. This first war—including the destruction of half the municipalities in Samar and the burning of tens of thousands of tons of rice—caused a lingering famine and sparked another war two years later. Today, we call this phenomenon “blowback.” The Pulahan War was both a civil war (inland highlanders against lowland merchants and farmers) and an anti-American insurrection. On the American side, it was fought by the Philippine Constabulary, Third District—a civil police force organized, funded, equipped (not well), and trained by Americans (usually former soldiers). 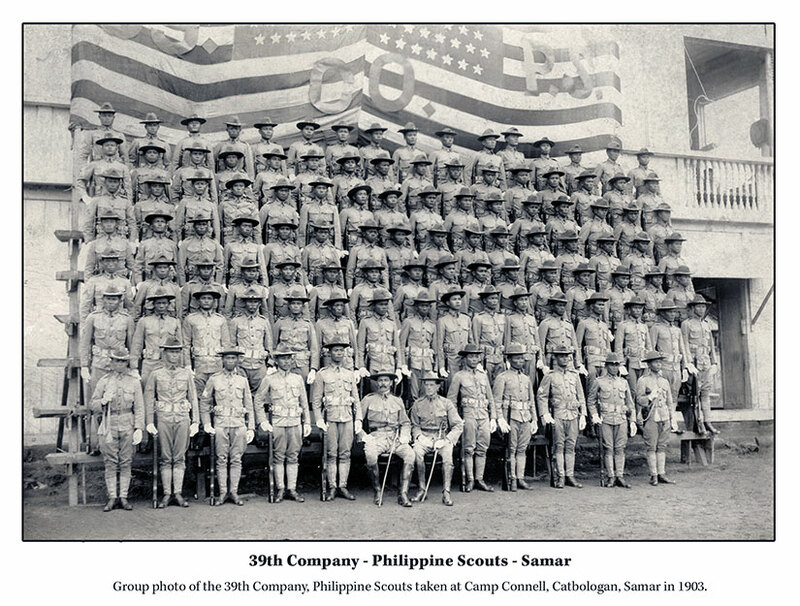 And by the 39th Philippine Scouts, trained and equipped (with better rifles) by the US Army. Both these units had significant troop presences in Catbalogan, along with the 6th, 12th, and 21st U.S. Infantries. 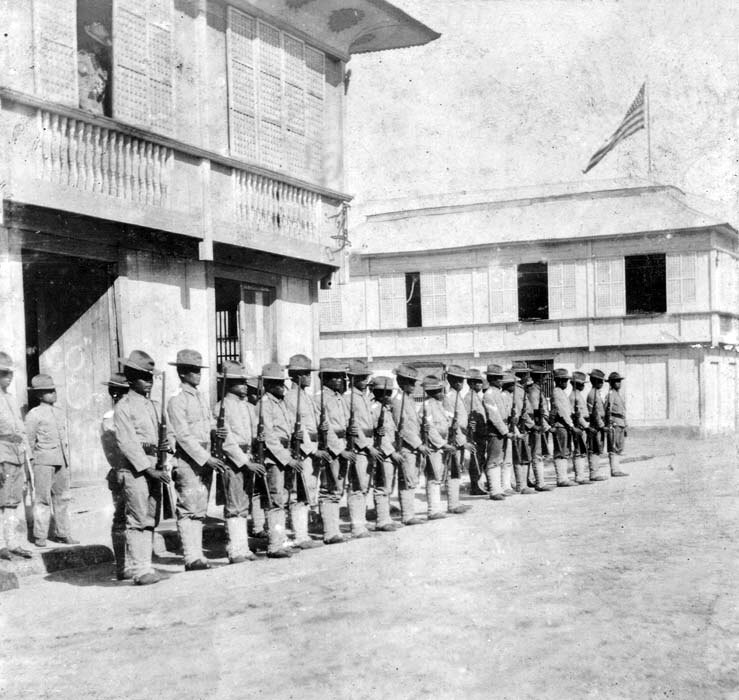 The 39th Company, Philippine Scouts, stands at present arms outside their barracks in Catbalogan, Samar. 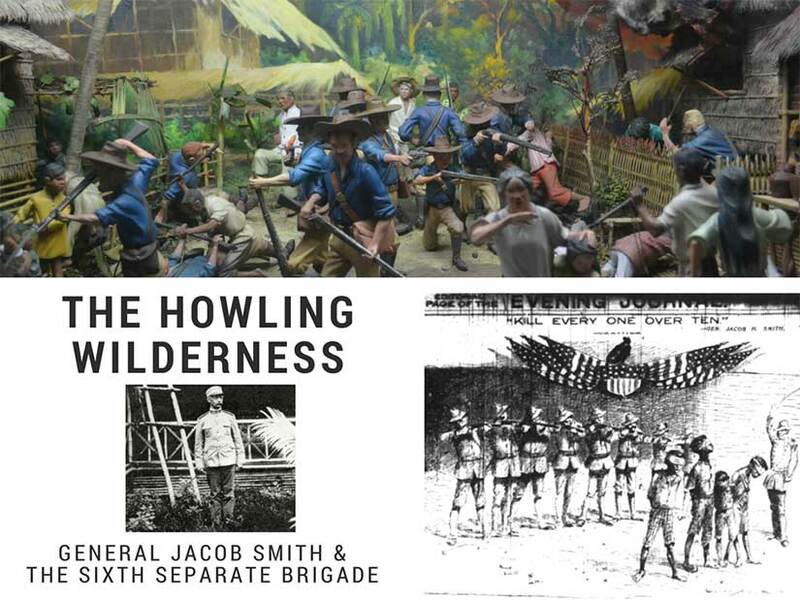 Both photos (above and below) courtesy of Scott Slaten of the Philippine-American War Facebook group. Catbalogan was a highly fortified town, but it was still beautiful. The ring of mountains separating it from the suffering of the rest of Samar did make for a stunning backdrop. 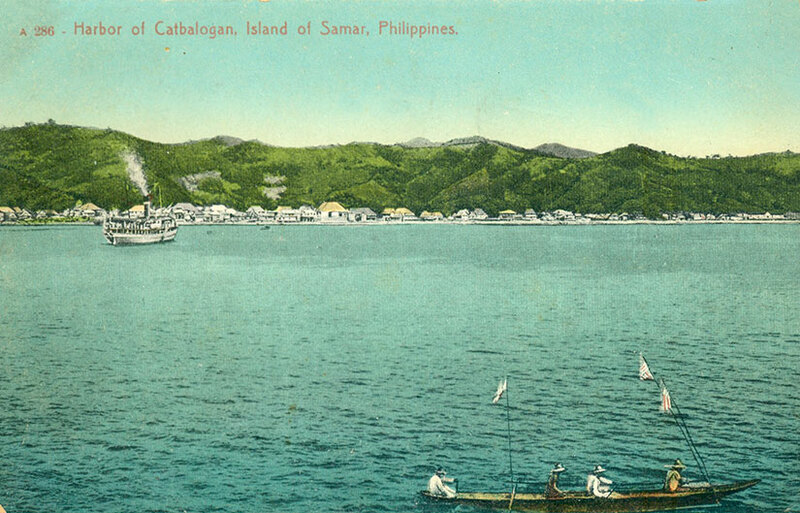 Colorized vintage postcard of a steamer coming into to dock at Catbalogan, Samar, Philippines. Scan courtesy of Scott Slaten of the Philippine-American War Facebook group. The city fared better than the rest of Samar through the lean times. Though the galleons no longer journeyed back and forth to Spain, Catbalogan was a center of the abaca trade in the 19th and 20th centuries, hence the large buildings and church. Abaca, also called Manila hemp, was in high demand as naval cordage. Its trade was dominated by ethnic Chinese and British merchants, and once Samar was no longer in ashes, the fiber would revive and bring an influx of capital to Catbalogan. 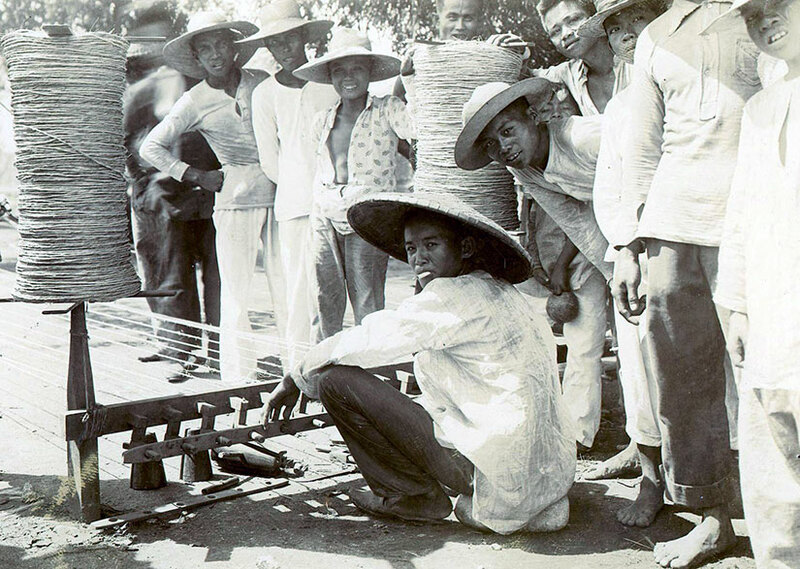 Filipinos making rope. This photograph shows the hemp as it comes from the leaves and is put on the spool for winding. Courtesy of the Philippine Photographs Digital Archive. 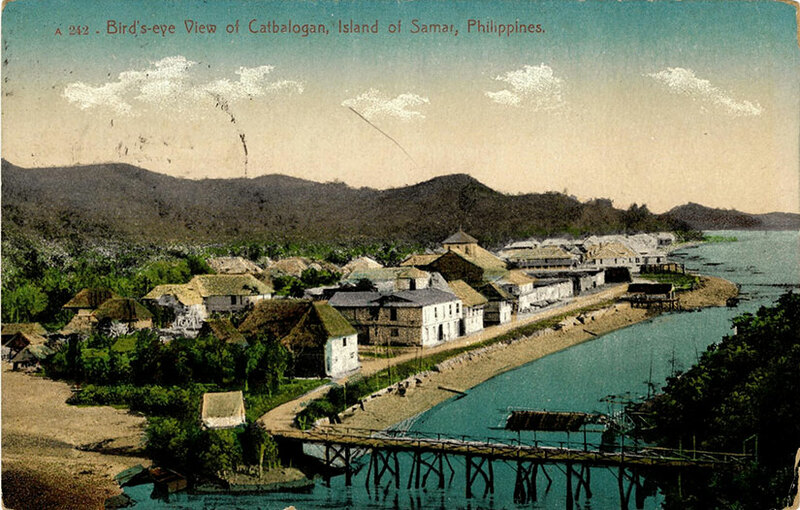 Vintage postcard of Samar with a view of the wooden causeway connecting town to the port. Scanned image of the early 20th-century card by Leo D. Cloma. In the early twentieth century, Americans complained about the lack of poultry, eggs, and fruit in Catbalogan. (I find the fruit claim hard to believe.) They also complained about the lack of dedicated school buildings—not one in the whole town—and the lack of teachers. (Whose fault is that?) And they complained that there were only five miles of road on the whole island. The Americans would build more. I traveled to Samar in 2005—and while I would not recommend December for your trip because of the rain, I loved it. The island is just as breathtaking as the postcards from 100 years ago. 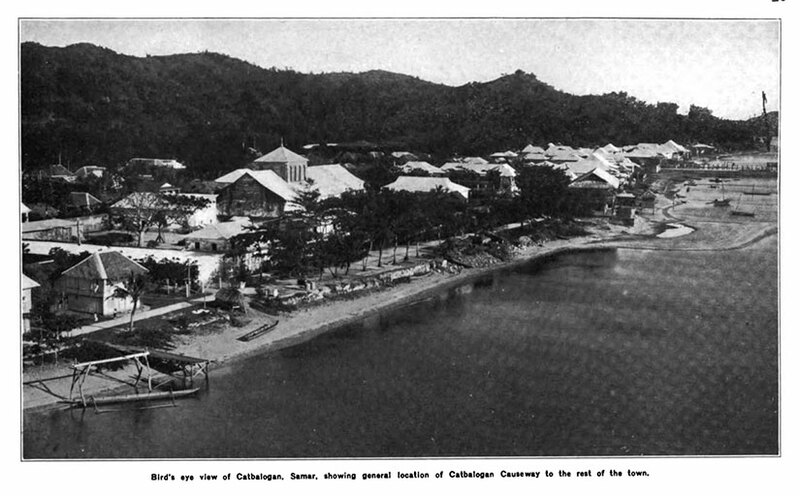 Another view of the coast and causeway from the Quarterly Bulletin of the Bureau of Public Works. [B]y mid-1905, the entire 21st Infantry, three companies of the 6th Infantry, and two companies of the 12th Infantry were all serving on the island. A small flotilla of five gunboats and two steam launches ferried troops and supplies, protected towns and directed artillery and machine-gun fire against Pulahan concentrations. Perhaps most significant, the Army re-equipped its nine Scout companies with modern magazine rifles, providing them with the firepower to shatter massed bolo attacks (59). It was about to be a whole new war. The Army was willing to bring their numbers to bear, but they had to be careful to avoid the kind of excesses that “Hell-Roaring Jake” Smith had used only years before. Smith’s tactics, which added fuel to the fire of rebellion, were exactly what Samareños expected from US Army regulars. Therefore, it was especially important that the newly arrived soldiers use restraint. Even the Manila Times warned: “If any exterminating is done, there is apt to be trouble. Dead men tell no tales, but they sometimes make an awful smell” (Quoted in Linn 65). The Army also had to be careful to avoid the public relations nightmare of Bell’s tactics in Batangas, even if they had been effective. This time, the Army did not create concentrated zones along the coast, though sometimes farmers had to be relocated to get them away from Pulahan-dominated areas. The Army kept garrisons on the coast for security, but they used the rest of their forces in mobile sweeps. Unlike the later “search and destroy” missions in Vietnam, these patrols were not meant to kill Pulahans, or rack up a “body count.” They were designed to “penetrate into every place which might afford a hiding place . . . [and] keep them constantly moving and in a state of uncertainty to the whereabouts of the troops which will be practically on every side of them” (Linn 65). In other words, they were to set the Pulahans on their heels, to wear them down, and to starve them out—all without troubling the people of Samar and Leyte too much. In no case, at the present time, should persons who may be in the hills and have not yet come in, be killed, unless by their clothing or manner it becomes apparent they are Pulahans, for it is a well-known fact that the peaceable inhabitants of many barrios have, by force, been driven from their homes and their barrios burned by the Pulahans, in order that they might be made to work for them and gather food. It is the policy of the Commanding General and the Civil Government, to get these people back into garrisoned places and from under the control of the Pulahan chiefs, and when they present themselves to the authorities they should be well treated (Quoted in Linn 66). Army patrol tactics were controlled and organized: soldiers marched single file through the jungle (in the mornings only) with fixed bayonets and a cartridge in the chamber. Odd-numbered soldiers faced one way and the evens the other. When attacked, they formed a compact mass around their civilian porters—these Filipinos were to be protected at all costs—and calmly fired (Linn 66-67). 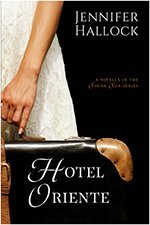 Conditions were difficult, but it did make for several romantic memoirs published in the early twentieth century. The military also set up good intelligence networks, and they did not turn down the services of former revolutionaries. Men who had taken part in the assault on Company C at Balangiga in 1901 were now on the payroll of the US Army quartermaster! Even the former mayor at Balangiga, considered the mastermind of the attack, helped the Americans against the Pulahans because they were threatening his hemp business (Borrinaga, G.E.R, “Pulahan Movement in Samar,” 251). As long as these authorities were seen as relatively honest and had good support among their people, they were used. [Allen] took practical steps to remove the injustices which created Pulahanism, ordering the Constabulary “to investigate and correct abuses connected with trade in the interior . . . 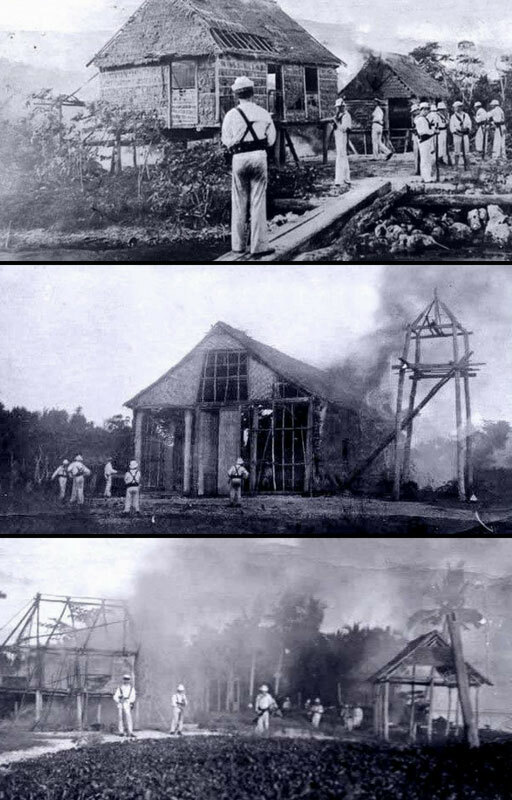 This is equally as important as capturing leaders and getting their guns.” With Manila’s support, Allen began construction of telegraph lines and planned a road across Samar that would end the mountaineers’ isolation, provide jobs for the destitute and allow troops access to the interior. . . . [also] Allen purged Samar’s civil officials, reprimanding or removing the excessively corrupt and inefficient (Linn 56-57).
. . . post officers distributed land to the refugees, encouraged crop cultivation, and punished corruption. . . . At Oras, which had been totally destroyed by the Pulahans, in one month soldiers distributed 2,728 pounds of flour, 2,100 pounds of beans and 15,260 pounds of rice to destitute Filipinos (Linn 59-60). The pièce de résistance of the American small war effort was amnesty. In Feburary 1905, General Allen issued the following order: “All Pulahan lesser ranks who wished to return to their villages and accept civil authority would be granted immunity; lower-ranking officers could obtain immunity by surrendering a rifle” (quoted in Linn 56). In fact, the civil government was so serious about amnesty that once, when the Scouts were in hot pursuit of a Pulahan band who had burned and looted a town called Poponton, they chased them right into the hands of the civil authorities. Quickly, the Pulahans surrendered to the constables, and when the Scout commander heard of this, he was outraged. But Sheriff W. D. Corn said that Governor Curry had told him to accept surrenders and that he would “not be a traitor to them, although they may be murderers” (quoted in Linn 61). This may seem like a short-sighted policy, but in the end the combination of carrot and stick worked. “Prisoners reported that Pulahans were dying of starvation; at one abandoned camp troops found every tree in a one-mile radius had been stripped of its edible foliage” (Linn 61). On the other hand, by “1 August  nearly 4,795 Samareños had presented themselves to the authorities”(Linn 60). 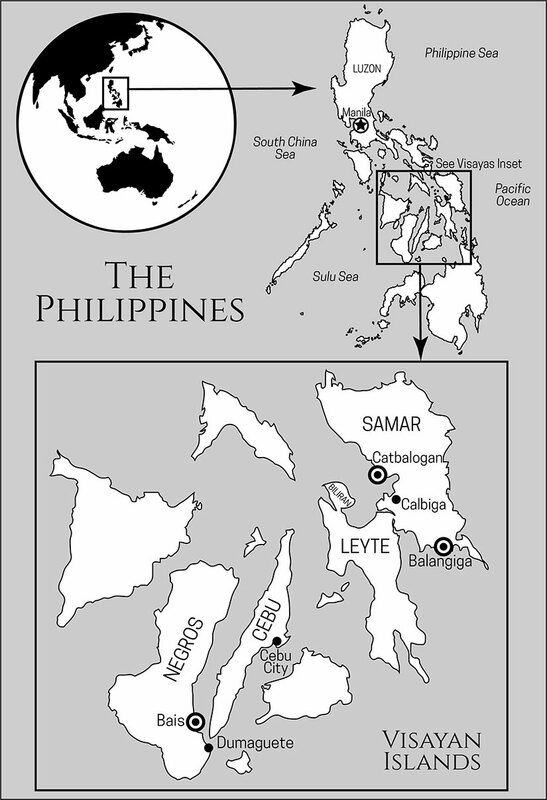 By May 1906, the Army declared northwest Samar “in as pacified or settled conditions as at any time since the insurrection” (quoted in Linn 63). While a few Pulahans continued to wander through the jungle until 1911, most of the popes of the movement were killed or captured in 1906. This was a short, isolated war. There were few large battles, which had to have been terrifying, but they did not get the largest headlines. The Moro War being fought further south tended to dominate the papers—and with good reason, since the Moros were possibly even fiercer than the Pulahans. (They even inspired the Army to develop a whole new handgun to fight them: the 1911 .45-caliber pistol, still in use today.) And since the Moros were and are majority Muslim, that campaign is often seen to be more relevant today. However, unlike Samar and Leyte, the Moros of Mindanao were never appeased. They were silenced temporarily, yes, but the last fifty years of Islamic separatism (and recently Islamist terrorism) prove that they were not pacified. The Pulahans were pacified. In fact, this war may be the only time the Americans fought a movement of religious extremists and won. (The Boxers were defeated militarily, but the Americans did not occupy Beijing long enough to really test their rule.) As millennial movements spring up all across the globe, will the secrets of Samar and Leyte make it into the handbook for the next war? Brandishing their talibongs (two-foot-long, razor-keen bolos), which could behead a man at a stroke, and assured of ‘invisibility’ by their anting-antings, they suddenly appeared in the valleys, red garb bedecked with crosses, charging en masse, shouting ‘Tad-tad!’ [“Chop-chop!”] as, in blade-spinning wave after wave, they attempted to overrun whatever stood in their path. If this does not sound fierce enough, some Pulahans carried a blade in each hand: “two revolving disks of scintillating steel,” according to Russell Roth’s article in volume 2, 1978 issue, of the Bulletin of the American Historical Collection. “One veteran witnessed a Pulahan split a soldier from his shoulder to his buttocks with a single bolo stroke” (Linn, 52). In fact, the Pulahans were better off with knives than rifles, partly because their captured Springfields were single-shot guns. (In this kind of war, no matter which side, by the time you reloaded, you were already dead.) Moreover, the Pulahans did not know how to use the gun sights, and they almost always aimed high (Hurley, 93). On the other hand, “When the Pulahans got to close quarters with their great knives, massacre was the result” (Hurley, 62). A rare and very large garab sword (or talibon/talibong) from the central Philippine island of Samar or Leyte. The wood handle has the original rattan woven handle wrap. The thick and heavy blade is well forged with a distinct pattern and hardened edge showing, while the scabbard features carved details. There were about 3,000 of these bolomen, and about 10,000 more men who provided them with intelligence and material support (Borrinaga, G.E.R, “Pulahan Movement in Samar,” 261). In January 1905, just before the worst of the fighting, there were less than 2000 armed Insular forces: 900 Constables (Filipino police under the civilian government), 600 Scouts (Filipino soldiers under US Army command), and about 350 regular American soldiers in the 14th Infantry (Linn, 55) on Samar. The Constables and Scouts had inferior rifles, the aforementioned Springfields. But even a Krag’s five-shot magazine was not a great choice in close-quarter fighting: “since not all men were issued bayonets, they found themselves using the rifle as a baseball bat in hand-to-hand combat” (Borrinaga, G.E.R., “Pulahan Movement in Leyte,” 232). The Pulahans not only terrorized the American forces, they terrorized lowland villagers, as well. Those who cooperated with the Insular officials were meted out punishments with special malice. In one town, they wrapped up the barrio lieutenant’s head in a kerosene-soaked American flag and set it on fire. The Pulahan leader said in front of the crowd: “Call upon the flag you have adopted to protect you now” (Hurley, 62). Then they burned down the village and carried off 50 of its people. This photograph was taken by and of members of the 39th Philippine Scouts, dressed in captured Pulahan uniforms and carrying captured bolos. Multiply these men by several dozen, at least, to get the full effect of a Pulahan charge. Photo scanned by Scott Slaten. Why was Governor Curry in an isolated village with only a Constabulary honor guard to protect him, anyway? Was he stupid, or just spectacularly optimistic? The answer is part of a larger reason why American rule on Samar was so vulnerable. Curry had wanted his civil government, made up of civilian bureaucrats, to get the sole credit for the surrender. As such, he did not invite the Scouts or US Army to the party. This rivalry between civil and military authorities—both American—was one reason why the initial response to the Pulahans was weak. The civil government under William Howard Taft and his subordinates on Samar and Leyte were “determined to show they governed with Filipino support, not armed force” (Linn, 53). General Henry T. Allen, commander of the Philippine Constabulary, should have turned over the Pulahan problem to the Scouts and Army earlier. The ill-equipped and understaffed Constabulary was built to keep law and order, not fight a war. But instead, Allen gave sanguine reports to his superiors in Manila that his men were getting the job done. In reality, “[b]y the end of 1904, many of the colonial forces were demoralized, much of the north and east of Samar was under Pulahan control, and the island was verging on anarchy” (Linn, 55). And then the U.S. Army showed up…again. Would they make Samar a “howling wilderness”…again? Read part three on the Pulahan War in the next post. 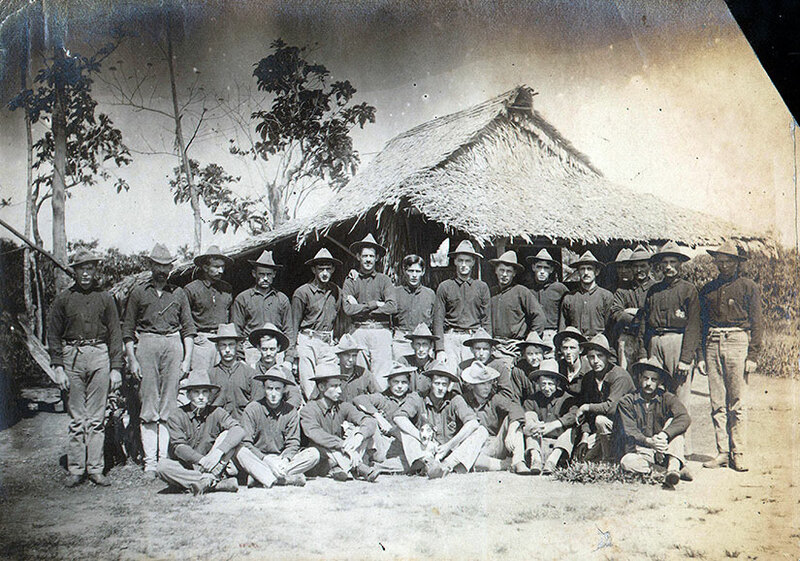 A group of soldiers in the front of a hut from the Philippines Photographs Digital Archive at the University of Michigan. If the Philippine-American War (1899-1902) gets little attention in history classrooms, the subsequent Pulahan War (1903-1907) in Samar and Leyte gets none. But it is the Pulahan War that may have the most parallels to later fights against the Khmer Rouge of Cambodia; the Islamic State in Syria and Iraq; the Abu Sayyaf/Maute group in Marawi, Philippines; Boko Haram in Nigeria; and even the Aum Shinrikyo terrorists, who released sarin gas on a Tokyo subway train in 1995. Maybe the Pulahan War is not studied because it was squashed in only four years—a short insurgency compared to the ones the United States has fought more recently. But shouldn’t that be a reason to study it? To find out how American soldiers (and American-trained Filipino soldiers) succeeded so quickly in Samar and Leyte, but cannot outmaneuver the Taliban after nearly two decades in Afghanistan? What really happened out there in the boondocks? Who are the Pulahans? The name given to them is thought to mean “red pants,” but few of these men actually had enough pants to set aside a pair as a uniform, let alone dye them a specific color. Sometimes they were known to wear red bandanas or other items, but not always. The name could also come from the pulajan, or red, variety of abaca grown by these farmers. The origin of the name “reds” is not what is important about them. What is critical is how they arose: from a specific cauldron of local grievances, traditional values, and foreign interference that so often gives rise to millennial movements. It began with the previous war. 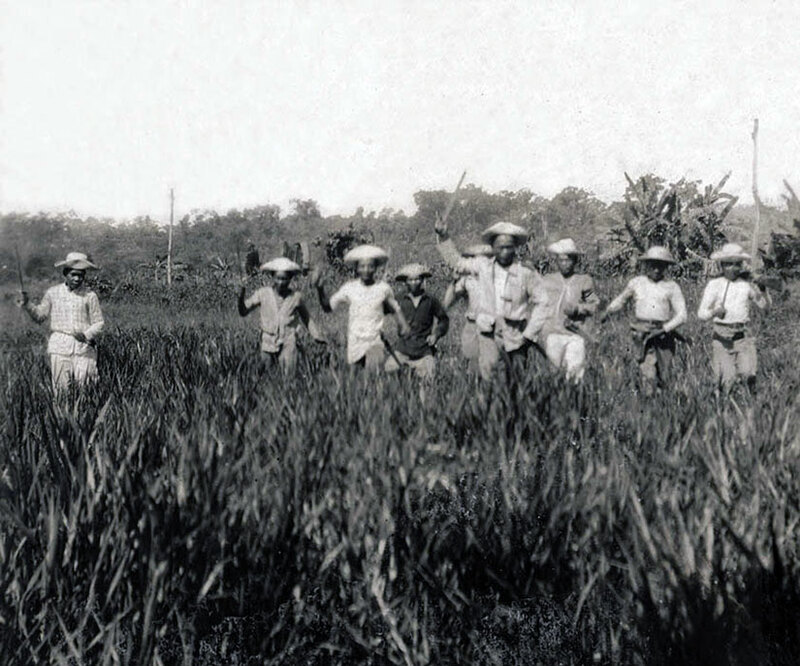 In April 1902, the captured revolutionary, Vicente Lukban, negotiated the surrender of the rest of his men: 65 officers, 236 riflemen, and 443 bolomen (wielders of a bolo, or machete-style, knife). These guerrillas brought in 240 guns and 7500 rounds of ammunition, much of which had been pilfered from Company C, Ninth Infantry, at Balangiga (Dumindin). Instead of punishing those who had participated in this attack, the Americans welcomed them in from the jungle. The colonial government even provided cloth, tailors, and sewing machines to outfit the men so they could parade through the capital city Catbalogan in front of the Army brass (Borrinaga, R.O., 20). This colorful celebration papered over the fact that Samar was a smoking ruin. In his implementation of General Orders No. 100, General Jacob H. “Hell-Roaring Jake” Smith ordered the burning over 79,000 pounds of stored rice and countless rice fields (War Department 1902, 434-51). One American soldier estimated that, by 1902, the island was subsisting on only 25% of a normal yield (Hurley, 55-56). Smith had ordered the destruction of entire villages, and he got his wish: by 1902, 27 of 45 municipalities were in ashes, and of those that remained only 10 had a standing town hall (Borrinaga, G.E.R., “Pulahan Movement in Samar,” 245). Worst of all, Smith ordered that all captured abaca harvests be destroyed (“Massacre Averted“). Known as “Manila hemp,” abaca is actually a banana plant whose strong fibers can be used as naval cordage, which was in short supply at the time. It was so badly needed by the U.S. Navy and merchant fleets that Congress had made a singular tariff exception for it before the rest of the free trade laws came into effect in 1913. Abaca and coconut products could have been the keystones of Samar and Leyte’s economic recovery, but in 1902 the harvest was, again, only 25% of pre-war levels. To make matters worse, a terrible drought hit Samar immediately after the war ended, from October 1902 to June 1903, so what abaca had not been burned by Smith’s forces was torched by the sun (Borrinaga, G.E.R., “Samar,” 245-49). 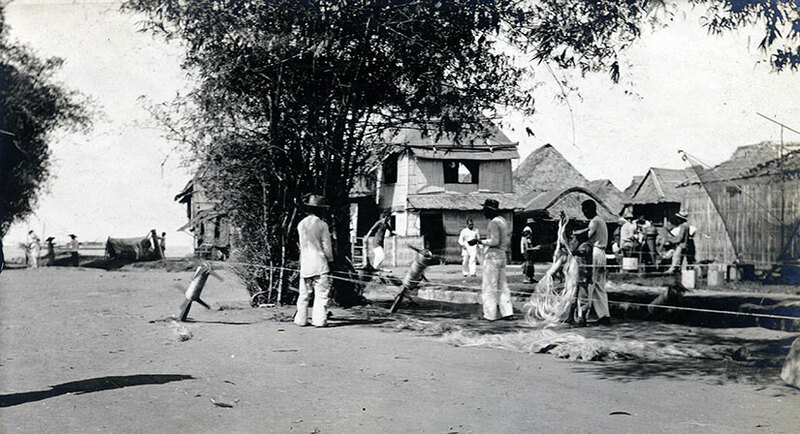 Making abaca (Manila hemp) rope in the street in Tondo, Manila. Photo courtesy of the Philippine Photographs Digital Archive. Even had abaca thrived, the Pulahans would not have gotten rich off the sales. Samar was structured like an island plantation: the growers in the highlands were beholden to the coastal elites. Lowlanders, as they were known, were the ones with ties to foreign merchant houses like Britain’s Smith, Bell, and Company. These elites paid the actual abaca growers less than half the crop was worth, and then they turned around and sold the peasants imported rice at a premium (Borrinaga, G.E.R., “Samar,” 257). Now that the island was “pacified,” the Americans demanded new taxes to pay for their civil government, including a twenty-peso tax on all adult Filipinos (Talde, “The Pulahan Milieu of Samar,” 229-30). The growers did not have twenty pesos—which was US$10 then, or $280 now—so they had to borrow it from the same merchants who had already fleeced them. All they had to stake as collateral was their thousand-peso plots of land. When they could not repay their debts—and the merchants made sure of that—the wealthy townsmen seized title to all they had in the world. To save their families from starvation, or from contracting malnutrition-based diseases like beri-beri, some parents sold off a child at a time to procurers from the big cities (Borrinaga, G.E.R., “Samar,” 258-59). These children would become servants, laborers, and prostitutes to pay off their parents’ debts. The grower had no one to complain to because the elites who had stolen from them were the mayors, police officials, and municipal authorities of Samar and Leyte. In fact, the twenty-peso poll tax that cost the grower his land had been used to pay the mayor’s salary, and you can be sure he was paid before any of the other tax funds were allocated (Borrinaga, G.E.R., “Pulahan Movement in Leyte,” 255). If the growers complained, they found themselves held on trumped-up charges until they sold the abaca at the desired rate—or for less. “[American] garrison commanders were both appalled and outraged at the mistreatment they witnessed. The civil officials in particular seemed completely irresponsible, robbing their constituents in the most brazen manner” (Linn, 69). If that was not enough, the 1902 cholera epidemic killed 3175 people in Samar and 4625 in Leyte (War Department 1904, 232). (For Samar, that was about as many as died during General Smith’s “howling wilderness.”) Livestock had also fallen victim to war and disease (specifically, rinderpest). 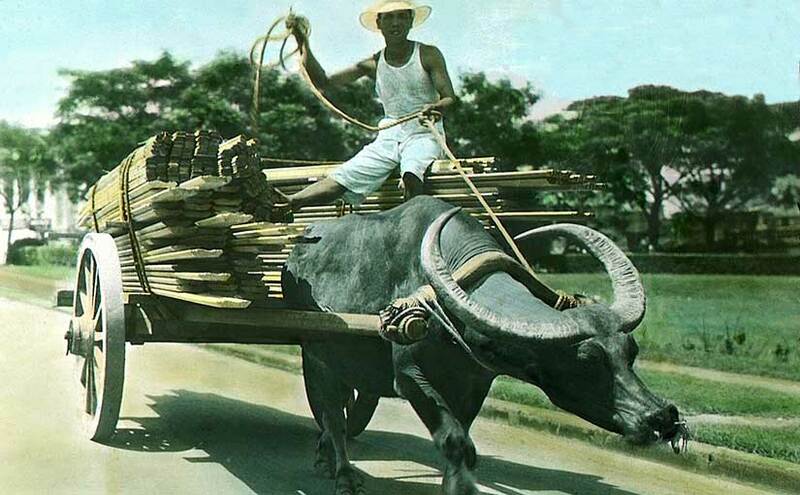 Carabao, or local water buffalo, fell to 10% of their pre-war numbers, according to one contemporary source. The price to replace them went up by a factor of ten (Hurley, 55-56). Because carabaos were essential to plowing and harvesting all crops, their absence meant the starvation that had driven the guerrillas to surrender would continue. The governor of Samar province, George Curry of New Mexico, knew the peasants were “industrious and hardy people” (Executive Secretary for the Philippine Islands 1906, 584). The problem was that the Americans needed the lowland elites on their side—many of the revolutionaries who had surrendered in April 1902 were these elites, and they were already worming their way into Insular Government positions. The peasants could fall in line with a regime that robbed them blind, or they could look elsewhere. They looked elsewhere. Specifically, they looked at an old movement for answers to new problems. There had been a messianic group under the Spanish in the late nineteenth century, the “Dios-Dios,” which arose in similar economic conditions as those described above, including both smallpox and cholera epidemics. At the time, the highlanders thought their illness would be healed by a mass pilgrimage to Catholic shrines to pray for their loved ones’ souls. But the Spanish, thinking this exodus from the mountains was a revolt in the making, attacked the peasants, thus igniting a several-year-long struggle (Couttie). In 1902 this movement resurfaced—or maybe it had never left. Several of the key figures in Lukban’s guerrilla war—the ones who had not surrendered—had been tied to Dios Dios. While under Lukban, the war had not taken on a distinctly religious character, his most die-hard supporters now made fighting Americans a mission from God. Pope Ablen Faustino, leader of the Pulahans in Samar. The Pulahans appropriated a specific Dios Dios-brand of Catholic syncretism, similar to the folk tradition of the babaylans (faith healers). The Pulahans called their leaders popes (“Papa Pablo” or “Papa Ablen,” for example), displayed crosses on their clothing or ornaments, and mentioned Jesus and Mary occasionally. They also prayed to living saints, like the “goddess” Benedicta, who, decades before, had led a crowd of 4000 followers up into the mountains to prepare for the coming apocalypse. Benedicta described the coming end of times as a flood that would wipe out the thieving lowlanders while keeping the mountains safe (Borrinaga, G.E.R., “Leyte,” 211). The Pulahans kept this blend of Visayan animist and Roman Catholic practices—all without the hated Spanish friars and priests. In fact, like Benedicta, Pulahan women were often priestesses, especially in the highland farming communes hidden within the jungle. To the Pulahans, this location made perfect sense. These were sacred mountains that symbolized light, redemption, and paradise (Talde, “Pulahan Milieu,” 215). This would be where Independencia, when finally freed from its once-Spanish-now-American box, would fashion a world with “no labor, no jails, and no taxes” (Hurley, 59). Even better, “once they destroyed their enemies, [Papa Ablen] would lead them to a mountain top on which they would find seven churches of gold, all their dead relatives who would be well and happy, and their lost carabao” (Roth, Muddy Glory, 99). In retrospect, it seems impossible for the highland people of Samar and Leyte not to join the Pulahan revolt. The Pulahan soldiers were a special kind of fierce: they did not cut their hair, did not cut down vegetation while trekking through the jungle, and did not need food or water on their multi-day operations (Talde, “Bruna ‘Bunang’ Fabrigar,” 180-81). They wore special charms, known as anting-antings, made out of anything: cloth, paper, or even carabao horn. 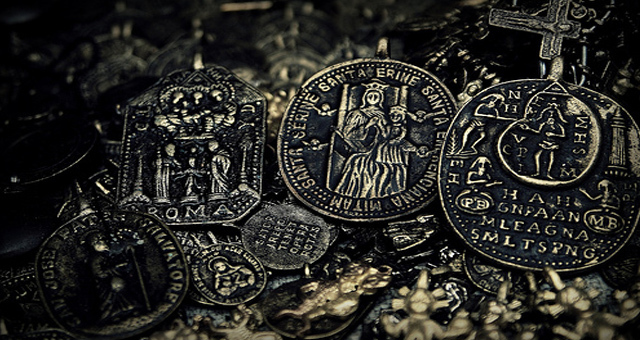 Special prayers—composed of pseudo-Latin, local languages, and numerology—offered protection against bullets and bolos. “Should they be shot, which could only happen if they turned their backs, their spirits would return in another person’s body in three days, or if hacked by a bolo, in seven days” (Borrinaga, G.E.R., “Leyte,” 230-31). Even better, this reincarnation would deliver the soul to another island. It was a decent way out, given the conditions on Samar and Leyte at the time. From the Aswang Project description of anting-anting.
. . . a religious or ideological movement based on the belief in a millennium marking or foreshadowing an era of radical change or an end to the existing world order; especially (a) believing in the imminence or inevitability of a golden age or social or spiritual renewal; utopian; (b) believing in the imminence or inevitability of the end of the world; apocalyptic. Millennial movements are often caused by rapid economic and cultural change, an increased foreign presence, and natural disasters or war. Samar, Leyte, and China had all these things. Afghanistan did, too. So did Iraq, Syria, Nigeria, Cambodia, and more. Like all these countries, the Pulahans believed salvation would be theirs eventually, even if they would have to help God along a bit. When the righteous flood finally came, the Pulahans would be on their Monte de Pobres (Mountain of the Poor), the “surest and safest place” in the islands (Borrinaga, G.E.R., “Leyte,” 211). From there they could establish a perfect Samareño kingdom on earth, free from Spanish, American, Chinese, and mercantile interests. Only it did not go quite like that. Read more on the Pulahan War in part two. 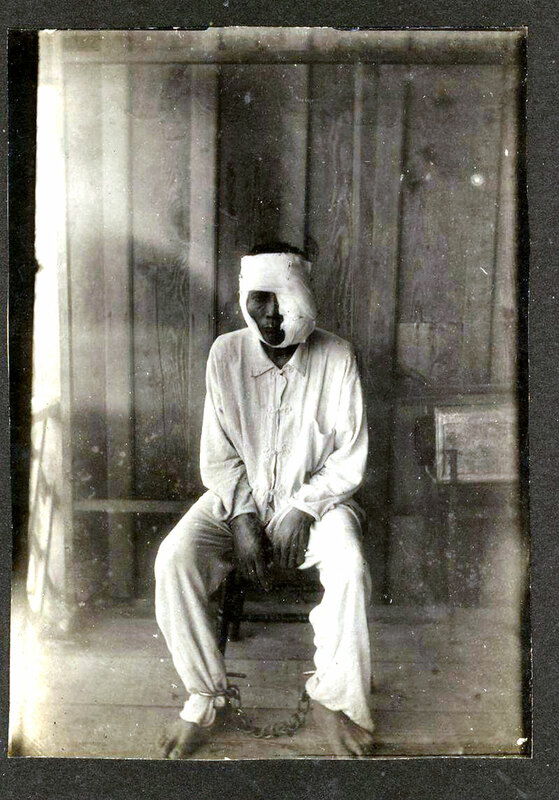 My upcoming book, Sugar Moon, will be firmly rooted in history that I believe every American should know: the ambush of a company of American soldiers on September 28, 1901, in Balangiga, Philippines. Most people have never heard of it. What happened that day in Balangiga—and in the months of American counterattacks afterward—has been overshadowed by other towns that Americans do know, ones with names like My Lai and Fallujah. Had we learned the lesson of Balangiga, though, these two towns in Vietnam and Iraq might never have hit the headlines. In fact, they might not be noteworthy at all. 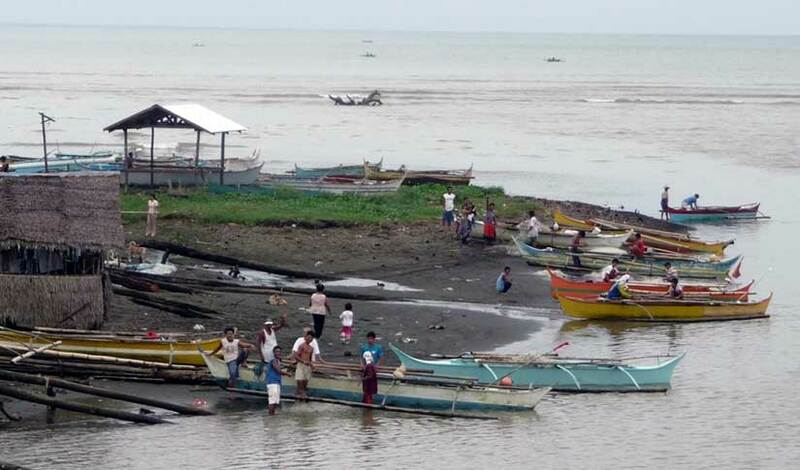 My photo of fishermen in Balangiga, at the junction of the Balangiga River and the Leyte Gulf. From there, it is not far until you are in the Pacific Ocean. How did I stumble upon Balangiga? When I started plotting my story about an American schoolteacher and a Filipino sugar baron—the story that became Under the Sugar Sun—I did a lot of research at Ateneo de Manila University, where I read through old issues of the Manila Times on microfiche. (By the way, if you want to entertain me, give me two rolls of that microfiche and leave me there all day. It’s like giving a child an iPad. History is my babysitter.) One of the articles I stumbled across was entitled: “Sister Hunting for Brother: His Name is E.L. Evans and He is Supposed to Be in the Philippines.” From there, I conjured up the idea of a missing brother to bring Georgina Potter to the Philippines. 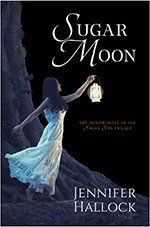 Yes, she was hired by the American colonial government to start a school in the Visayas, but her real motive in coming—and for letting herself get entangled with a jerk named Archie—was finding her brother, Ben Potter. A character board for Sugar Moon. 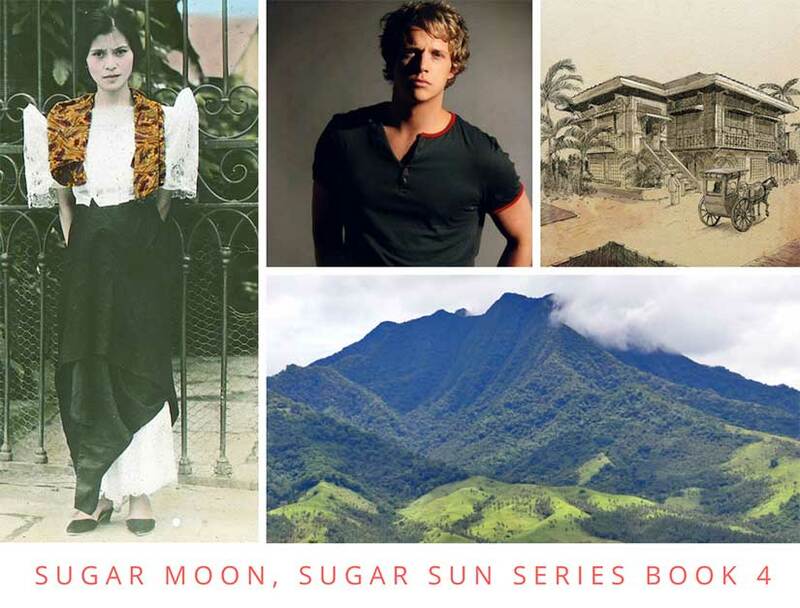 From left: a Filipina in 1900 who inspired Allegra Alazas; actor Chris Geere, one of my possible “castings” for Ben; a local house; and Mount Suiro on Biliran Island, location of some adventures. Sorry, no more spoilers! “I see a Ben Cutter,” the clerk said. “That’s probably him.” He sounded sure, as if the U.S. Army made such mistakes all the time. Maybe they did. In fact, the Army did print various lists with different spellings of names: Dettron or Bastron for Sergeant Frank Betron, the model for Ben Potter. This is one of the reasons why I chose this setting for my character. It makes sense that if he survived, he still might not want to be found. Moreover, several survivors stayed in the Philippines afterward—in Betron’s case, maybe to find a woman from Balangiga. Now, there’s a story there! So, it was decided: Ben served in Company C, Ninth Infantry, which saw action in China during the Boxer War, and then returned to the Philippines to be stationed in Balangiga. Poor Ben. Poor Balangiga. Company C occupied this town, and occupation is ugly. It doesn’t matter how you justify it—in this case, blockading the southern coast of Samar so that the guerrillas in the mountains could not be resupplied, a legitimate military purpose. It also doesn’t matter if the occupation starts off peacefully, which it did in Balangiga. It is not going to stay that way. The lesson of occupation throughout world history—no matter whether we are talking about ancient Greek occupation of Jerusalem, Israeli occupation of Lebanon, the Soviet occupation of Afghanistan, or the American occupation of the Philippines—things will go downhill. 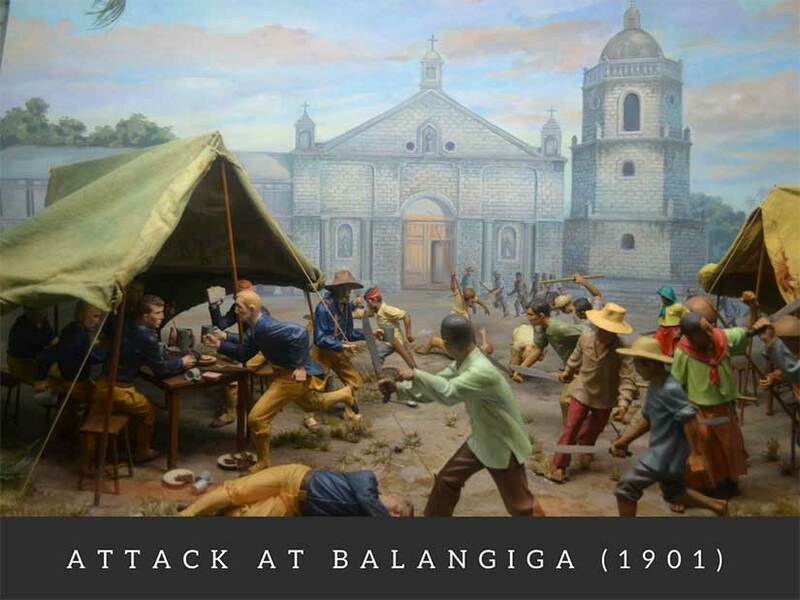 The Americans called the Filipino guerrillas insurrectionists, and they labeled what happened in Balangiga a massacre, implying that the perpetrators had no just cause. On the other side, Filipinos call their soldiers revolutionaries, and they see the event itself as a just uprising. If you want to avoid all judgment, it was an incident, or more specifically an ambush. 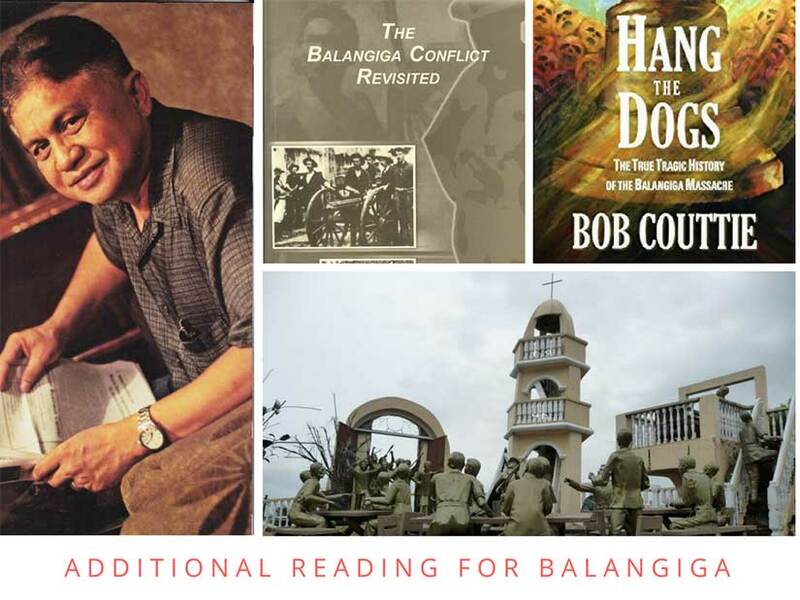 I am greatly indebted to Philippine historian Rolando O. Borrinaga and British writer Bob Couttie for their first-hand research and outstanding work on Balangiga. In my version of the story, I have taken some liberties—merging characters to simplify things for the reader, renaming a few people—but I hope that my unwitting mentors will find that I got the big brush strokes right. All errors are my own, of course. Two outstanding scholars on the Balangiga Incident, Rolando O. Borrinaga and Bob Couttie. Bottom right is my photo of the monument to the attackers in Balangiga town. As we will see in Sugar Moon, at first things went okay. Uneasily, but okay. An American officer played chess with the parish priest. The man Sergeant Benjamin Potter is based on studied martial arts with the police chief. Individuals got along. But here’s the rub: if the townspeople became too friendly with the Americans, they would face retribution from the revolutionaries up in the mountains. So the town tried to play it cool, stay neutral. The southern coast of Samar is not the easiest place to patrol. This is the Cadacan River near Basey. Image courtesy of Iloilo Wanderer on Wikimedia Commons. But the Americans noticed some strange things happening—like sweet potatoes planted in the jungle for the guerrilla soldiers, or townspeople not cutting down banana trees that could provide the guerrillas cover—and the Yanks thought they had been betrayed. They ordered the town to cut down essential food sources, to “clean up” the town. If the town complied, not only would they need to destroy their own property, they would also endanger the understanding they had with guerrillas. I think you probably see where this is going. The reality of a town like this during occupation is that it will be caught in between two armies, and if neither army can truly protect the civilians against the other, the people must try to play one off the other. That is a dangerous game. The captain of Company C doubled down. He imprisoned the town’s men in conical tents that looked like Native American teepees. These Sibley tents were supposed to sleep 16, but were each jammed full with between 70-90 men and boys who had to sit on their haunches all night. They were not fed dinner, and in the morning they were forced to cut down the food their families depended on. This went on for several days. 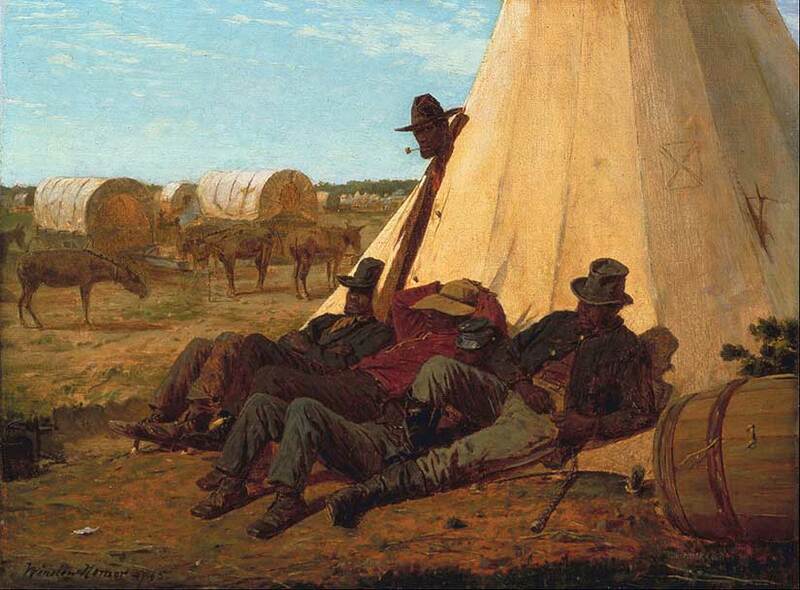 Several African-American Union Army Teamsters rest on a Sibley tent in 1865, giving some sense of their size (and age). It is a crowded sleep for 16 inside, let alone 70 or more. Winslow Homer’s The Bright Side, is in the public domain. Image courtesy of Wikimedia Commons. The Americans did not see the town turning against them. They only saw their own frustration: they felt alone, vulnerable, on the edge of a hostile island, a day’s travel away from the nearest garrison. Yet they did not expect the ambush. My character Ben will narrate the whole debacle through his flashbacks, which starts with him trying to court a local woman. He’s a proper gentleman, don’t worry, but he’s smitten. On Sunday, September 28, 1901, the morning after the town fiesta, the police chief attacked the American sentry. A church bell rang. Warriors rushed out of the jungle line east of town. Others dressed as women streamed out of the church with machetes. The American soldiers were eating breakfast. Dozens would die immediately and gruesomely. A little more than half would manage to escape, and several of them would die along the way of their wounds or from other attacks. In total, 48 of 77 Americans would die. One of many wonderful dioramas designed by the Ayala Museum and now viewable through the Google Cultural Institute. 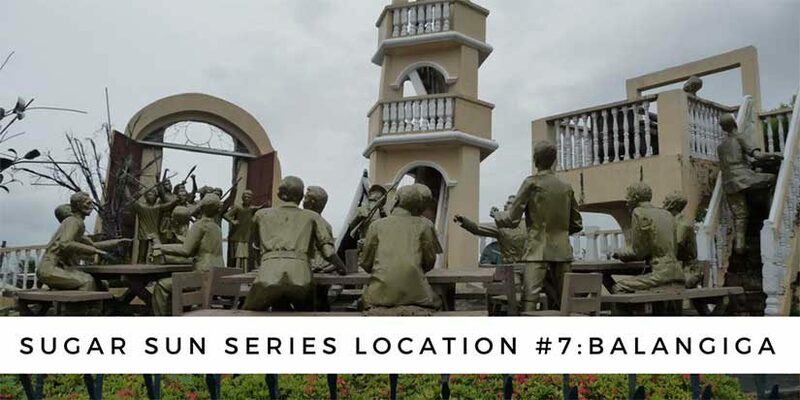 Americans blamed the Filipino revolutionaries—General Lukban’s men in the interior of Samar—but the truth Borrinaga and Couttie uncovered is that the town actually planned the attack themselves. They may have borrowed some men from villages outside Balangiga proper, and they may have coordinated with the revolutionaries, but this was a town fighting back against the soldiers who had imprisoned them. After that, all hell broke loose. If there is something more violent than the rising up of an occupied people, it is the revenge exacted by a conventional military force armed to the teeth. The American commander in Samar ordered his men to turn the entire island into “a howling wilderness” by striking down all men and boys capable of carrying arms, which he defined as all those over ten years old. (This is in violation of General Order No. 100, which served as the American law of war at this time.) 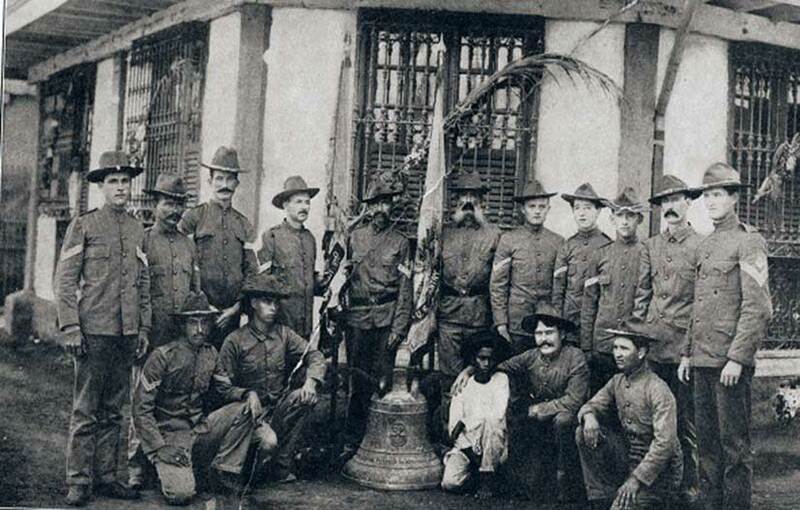 American soldiers made a special trip back to Balangiga to burn down the town and kill anyone in sight. Months of revenge resulted in the deaths of thousands on Samar, maybe as many as 15,000, according to Borrinaga. The destruction was so widespread that it sowed the seeds for a whole new war only three years later. Another of the many vivid dioramas designed by the Ayala Museum and now viewable through the Google Cultural Institute. Also included are a photo of General “Hell-Roaring Jake” Smith and the New York Journal editorial cartoon of his order. Both are in the public domain and are found on Wikipedia. This was the My Lai moment of the Philippine-American War, and it was just as explosive to the American public as that incident in Vietnam was. For the first time, with the advent of the trans-Pacific telegraph cable, the American public could follow events with an immediacy that had been previously impossible. The excesses of the Army now blanketed newspapers and magazines Stateside. Though military authorities tried to censor the press by controlling the telegraph lines out of Manila, reporters got around this by traveling to Hong Kong to wire their stories. The courts-martial of several American officers made daily headlines, and Senate hearings began on the issue of American atrocities in the Philippines. The survivors of Balangiga in April 1902. Photo in the public domain, courtesy of Wikimedia Commons. But how do you criticize the methods of occupation without questioning the whole endeavor to begin with? You can blame a few “bad apples” to satisfy the public, but is it enough? The general in Samar received a slap on the wrist from the court-martial that followed, and though popular outcry in the US later forced President Roosevelt to demand the general’s retirement, the punishment still didn’t fit the crime. The general retired with a full pension. Similarly, the American lieutenant in command at My Lai, convicted of murdering 22 Vietnamese civilians, served only seven months of house arrest and then was pardoned. In both cases, “marked severities” divided the American public. A military hospital in Manila. Photo in the public domain. My character Ben tried hard to be better than the rest, but what happened in Balangiga tortures him. 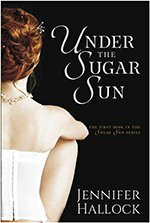 You are not supposed to have liked him in Under the Sugar Sun, and he does not like himself much, either. He suffers from Post Traumatic Stress disorder, something that two of my very best friends share with him. 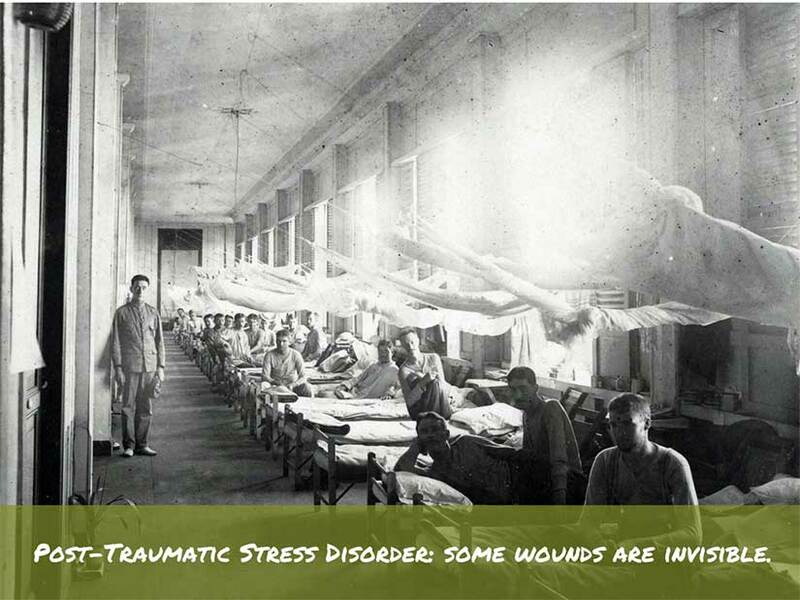 Soldiers with PTSd struggle with guilt, depression, substance abuse, anger management, insomnia, and other health problems. I am greatly indebted to these friends for letting me put some of their worst fears on the page. I hope they will also appreciate the redemptive journey Ben goes through and the healing power of love that he finds. They would tell me this is far too simplistic a cure, but I think they want Ben to have a happily-ever-after, so it’s okay. George Santayana wrote in 1905: “Those who cannot remember the past are condemned to repeat it.” It is fitting he said so at the outset of what was later called the American Century. The vigorous debate about the use of military force abroad—and it’s aftereffects like PTSd—are familiar to people today. But they were not really a part of American discourse until the Philippine-American War. America’s professional army was born out of this war. Before 1898, the entire US Army was smaller than today’s New York City Police Department. Most of the Spanish-American War had to be fought with state volunteers whose enlistments lasted only a year. When hostilities broke out in Philippines, Congress promptly doubled the size of the regular army once, and then doubled it again. For the first time in its history, America had a significant standing army stationed far from its borders. Maybe it is not good enough to just remember the past. You should experience it yourself. That’s the garden where empathy grows. That’s where you get all the feels. I hope Sugar Moon helps. Photograph of an American reconcentrado camp, the exact tactic we blamed Spain for in Cuba.